Seabourn, the world’s finest ultra-luxury cruise line, has revealed renderings of its new signature fine-dining restaurant, The Grill by Thomas Keller, which will debut in May 2016 onboard Seabourn Quest. With a menu and ambiance inspired by the classic American chophouse, The Grill is a collaboration between three-star Michelin chef Thomas Keller and designer Adam D. Tihany, exclusively for Seabourn. “We are delighted Chef Keller has partnered with us to produce such a standout dining experience for guests to enjoy as they travel the world with Seabourn,” Seabourn President Richard Meadows said. The new signature restaurant will be on each Seabourn vessel, including Seabourn Encore which is scheduled to launch this December. 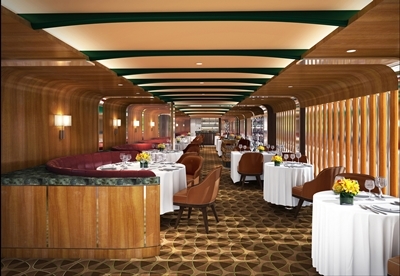 The Grill by Thomas Keller will move into newly renovated spaces formerly occupied by Restaurant 2 on the current fleet, beginning with Seabourn Quest in April and followed by Seabourn Sojourn and Seabourn Odyssey during regularly scheduled dry dock periods. Seabourn Ovation will offer The Grill by Thomas Keller right from its launch in 2018. The interior designs by Adam D. Tihany enhance the dining experience with spaces that will be distinctive to the ships, yet defined by intimate settings with an elegant and warm masculine quality. 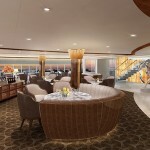 On Odyssey-class ships, the space will feature curvilinear lines throughout, including lush leather banquettes and tan leather swivel chairs that line the dining room; ceilings of curved wood coffers that reference design details of a luxury yacht; and metal mesh panels topped with elegant emerald marble at the face of the bar. A culinary visionary and the innovator behind The French Laundry in Yountville, California, and Per Se in New York City, Chef Thomas Keller’s partnership with Seabourn began in 2015 and highlights the luxury cruise line’s commitment to offering outstanding guest experiences. Guests of The Grill by Thomas Keller will be treated to a timeless menu featuring the freshest produce from artisan purveyors, such as table-side preparations of Caesar salad and ice cream sundaes as well as a range of other steakhouse favourites like Lobster Thermidor and creamed spinach, presented a la carte. The Grill by Thomas Keller will be open for dinner daily on all Seabourn vessels, and guests will have the opportunity to secure reservations online in advance of their cruise beginning in April for May sailings on Seabourn Quest. In keeping with Seabourn’s all-inclusive rates, there is no additional charge to dine at The Grill.